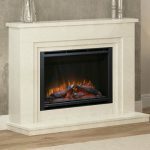 If you are looking to give your fireplace and room a different aesthetic, look no further than the Elgin & Hall Cast Stove Front fire. 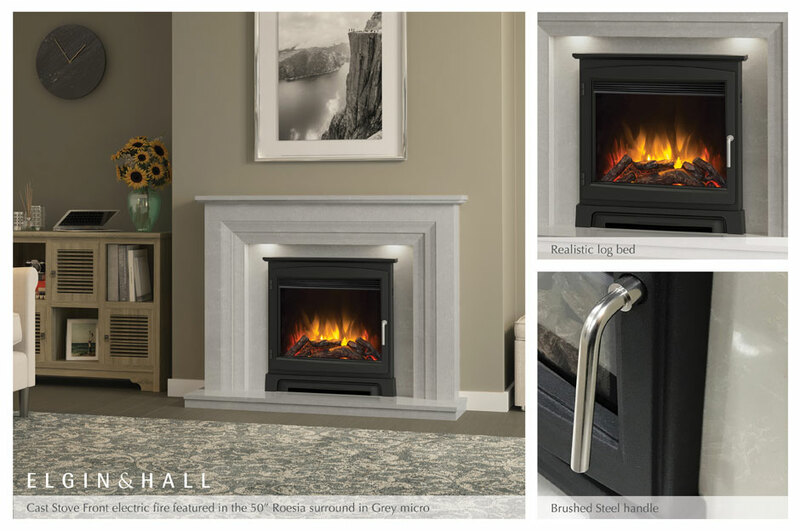 This striking trim conveniently fixes directly onto the front of your existing Elgin & Hall widescreen fire, (such as the Chollerton), giving you the look and feel of a real stove. The Matt Black, sleek cast frame and contrasting Chrome handle adds character and charm to any room. 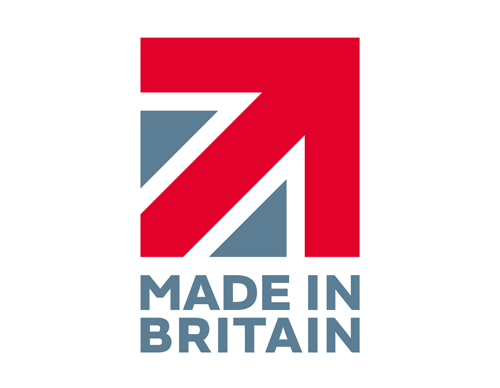 Who would have thought that such a small change could completely transform your living space, allowing you to adapt your room with changing interior trends, colours and seasons, as you please. This bold centrepiece also boasts a widescreen viewing window to showcase the mesmerizing performance of hypnotising flames within. 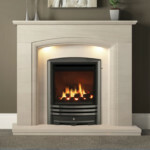 Available as a trim or complete with a widescreen electric or gas fire, which will you choose? 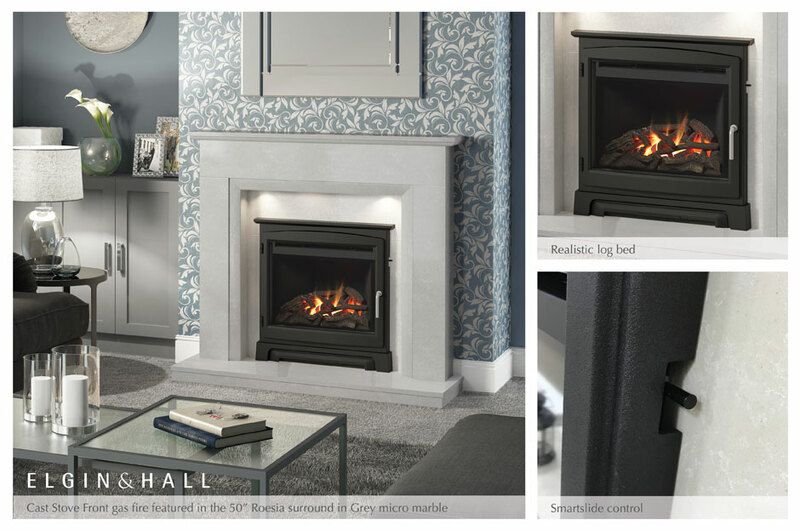 Guaranteed to draw an audience, the Elgin & Hall Cast Stove Front widescreen gas fire is a definite crowd pleaser. 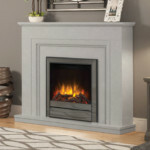 This fire has the power to create a cosy centrepiece in any living space. Sitting comfortably within the proportions of the Roesia shown below, it’s clear to see why this bold beauty is described as a statement piece. A discreet Smartslide control gives you the freedom to change the flame picture from smouldering to blazing at a touch, to suit your mood and desired room temperature. Simply press and release the control on the right side of the fire to bring the flames to life. You will become lost in the flickering flames, dancing upon the smouldering, realistic log bed. 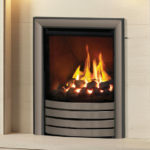 Suited to brick chimney or pre-fabricated flues, this gas fire is not just a pretty fascia delivering an impressive 88% efficiency and an Energy Efficiency Class of C. A panel of ceramic glass prevents air from being sucked up through the front of the fire and directs heat up the chimney, meaning that a higher percentage of convected and radiant heat is propelled back into your room. Bliss! 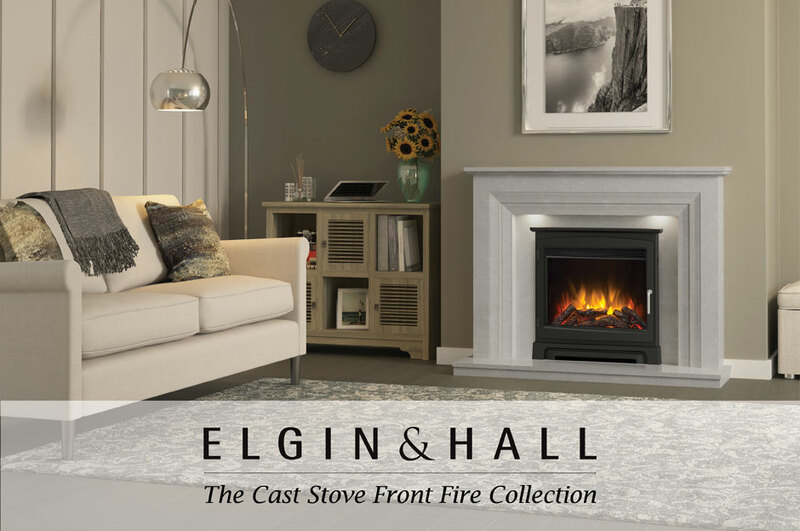 This stunning centre piece is not only restricted to a gas option; you can also enjoy the convenience of efficient, instantly controllable heat and clean maintenance free living with the Elgin & Hall Cast Stove Front electric fire. 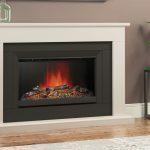 Effortless to operate, this bold fire comes complete with a remote control, to bring different levels of heat, light and flame to your fingertips. An LED flame effect only control option lets you experience the comforting glow any time of the day or year. A 2kW performance provides instant heat when you arrive home supplements central heating or allows you to heat just one room when the weather is on the cooler side – perfectly catering to today’s unpredictable weather. 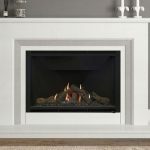 Because it’s electric, no chimney or recess is required (when purchased with the Amorina Deluxe in marble) – no messy building work – it’s just a question of simply plugging it in and letting the magic begin.